A video of the presentation and full workshop is available here. This report reviews both secondary data and primary evidence on the relationship between international trade and corruption and combines it with findings from the most recent literature on the impact of international anticorruption. 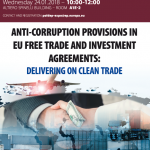 The report finds evidence that international trade agreements have the potential to act as the exogenous factor breaking the vicious circle of corruption in economies based on privileged connections rather than fair competition. International free trade agreements exert a positive influence by increasing competition directly in the removal of tariffs and so diminishing the power of rentier companies which influence domestic regulation in their favour, and by contributing to a fairer business environment through their transparency provisions; in other words, by reducing the non-tariff barriers generally used to the advantage of domestically connected companies. Evidence is presented that trade openness, red tape reduction and fiscal transparency, especially transparency of procurement, play positive roles in widening control of corruption and can be more easily influenced by external actors than the other important control of corruption factors- judicial independence, freedom of the press or the demand from civil society for good governance. The report argues that indirect good governance policies which increase competition and subvert power and economic monopolies or quasi monopolies are far more effective than direct anticorruption policies which in relying on domestic implementation tend to fall into the vicious circle again. The options offered are between an ‘economist’s approach’ with an apparently more modest but effective good governance package, a ‘lawyer’s’ approach’ with firm anticorruption language but unenforceable provisions even in EU countries (on bribery, for instance), and a ‘holistic’ approach where the EU would coordinate across international trade, promotion of norms and development aid to have a strong and consistent approach demanding good governance as part of its foreign and development policy. However, the report also warrants that the three options may be used alternatively, depending on the degree of development and quality of governance of the trading partner. The ERCAS team members Ramin Dadasov, Alvaro Lopes, Victoria Dykes and Debora Ferreira have contributed research for this report.